ZANU-PF youth leader Magura Charumbira, who is accused of booing former First Lady, Mrs Grace Mugabe during a rally at White City Stadium, has been further remanded. Charumbira (43) of Pumula South suburb, who is on $100 bail, was remanded to December 12 by Bulawayo provincial magistrate Ms Sharon Rosemani. He is facing charges of incitement to commit public violence and undermining the authority of the President. Charumbira is being accused of leading a group of Zanu-PF supporters that heckled Mrs Mugabe while she was addressing party supporters. 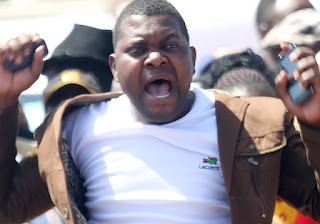 As part of the bail conditions, Charumbira was ordered to report thrice a week at the Bulawayo CID Law and Order offices and reside at his given residential address until the matter is finalised. Charumbira was also ordered to surrender his travel documents and confine himself within a 60km radius. Prosecuting, Mr Nkathazo Dlodlo said on November 4 this year, Charumbira was part of a crowd that had gathered at White City Stadium in Bulawayo for the Presidential Youth Interface rally. The court heard that when Mrs Mugabe stood up to address people, Charumbira, a ring leader of a group of supporters, also stood up and started protesting and heckling the former First Lady. “The accused person started making gestures by throwing hands in the air and booing Mrs Mugabe. His colleagues joined him as they sang songs denouncing the former First Lady after she said Professor Jonathan Moyo was being persecuted for nothing,” said Mr Dlodlo. Charumbira and his group were whisked away by other Zanu-PF youths after Mrs Mugabe complained that rogue elements were disrupting her speech. Charumbira was represented by lawyers, Mr Christopher Dube of Dube-Banda, Nzarayapenga and Partners and Mr Tanaka Muganyi of Tanaka Law Chambers.